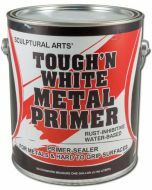 Sculptural Arts' Tough N White Primer is a quality water based, fast drying, primer-sealer with outstanding adhesion, designed to give scenic materials the best protection available. 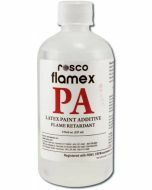 It is ideal for use under water-based or oil-based top coats and on interior or exterior surfaces, both new and previously painted. TintingMay be tinted toward the top coat color with Artist's Choice Saturated paints or water based universal tinting colors. Surface PreparationAll surfaces must be clean and free of oil, wax, dust, peeling paint and loose wallpaper. 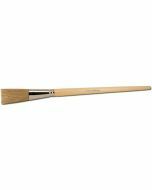 If surface is extremely dirty or chalky, wash with a stiff brush and water. 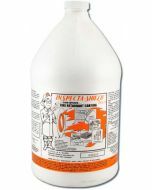 Clean mildew with a solution of 3 parts water to 1 part bleach. Check for unsound paint by cutting an "X" into the paint with a razor. Firmly press scotch tape over the mark and yank it quickly away. 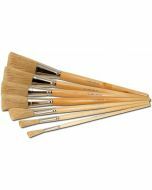 If paint releases, it is unsound and should be removed. ApplicationTough N' White Primer may be applied by brush, roller, pad applicator or sprayer. Do not apply below 50F. Average Dry TimeUnder normal conditions, dry to handle in 30-40 minutes. May be top coated in 1 hour. Low temperatures, high humidity, poor ventilation, may increase drying time. Use a shop or box fan to speed up drying time if needed.